Now that GM has officially announced a partnership with PSA Peugeot Citroën, we predict that the talking heads who don’t know any better and aren’t proficient in real-world business operations will spin it in all the wrong ways. You know, to pursue whatever political agenda. In essence, the partnership announced this morning is all about saving and leveraging economies of scale in purchasing and component sharing. The alliance of The General and Peugeot will create a global purchasing joint venture to source commodities, components, and other goods and services from suppliers, resulting in an estimated $2 billion in annual savings within about five years. Additionally, the companies will share vehicle components and modules — resulting in even greater savings. Both automakers, however, will continue to operate separately and individually. As part of the deal, GM purchased a 7 percent stake in PSA Peugeot Citroën for a total of $335 million — partly answering our question about what GM should do with its growing cash reserves. But we all know how certain idiots will twist the development and emphasize the fact that General Motors is investing in overseas companies. You know, using “tax payer dollars” to invest in non-American organizations. And this will result in the production of more small cars that aren’t capable of fitting gun racks. So it’s bad on all accounts: an American company investing in a European (should we throw in “socialist”?) corporation. Rabble rabble rabble. And how dare they? And rabble rabble rabble some more. 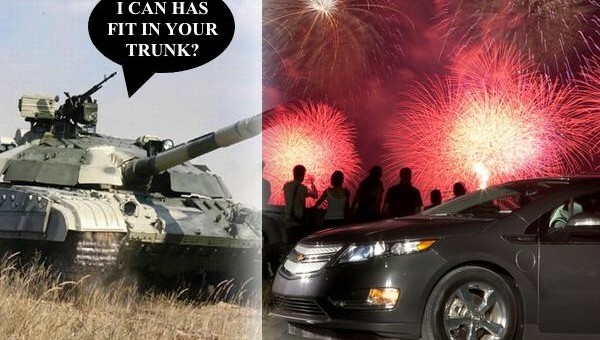 Now, since we’re on the topic of American patriotism, it’s important to mention that there are people who don’t want to buy an American-engineered, American-designed, or American-built car because it doesn’t hold a gun rack. Check that. It does. Oh, well then in that case it’s because of an ideology. Right. We all know who we’re talking about here. It’s the people who will say the most ridiculous things in hopes of casting this deal in the worst of lights, instead of labeling the move for what it really is: a strategic business development plan that makes fiscal sense and will allow General Motors to save sizable cash in Europe and around the world, thereby turning its European operations around and making them profitable. No, common sense, honesty, and truth can’t possibly prevail here. And being an American citizen, that troubles me more than anything. Now, where is my gun rack? This article is part of the GM Authority Opinion Desk series, where the GM Authority crew shares exactly what’s on the tips of their tongues and minds. Next story What’s The Biggest Difference Between New GM And Old GM? I hate the politicization of GM, and this alliance, and certainly condemn any criticism of the alliance through the lens of individual political gain. However I do not support blind support of the alliance either. Nothing is perfect, especially a deal with a struggling french automaker. What can Peugeot bring to the table that GM does not have? I see absolutely nothing. What does GM bring to the table that Peugeot does not have? Global reach. economies of scale, and most importantly, hard cash it desperately needs to survive. Three auto companies, in my opinion, have reached almost the full benefits of economies of scale, GM , Volkswagen, and Toyota. Any merger will not really help any of these lower costs in terms of purchasing power. If I remember correctly, Opel and Peogeot have a near identical market share and compete in many, many segments. Is saving sizable cash really going to help turn around Opel, Ford poured 1 billion dollars into Lincoln years, did it make a difference?, not yet. GM has a lot of problems, but money isnt one of them. And im suprised that the only benefit a annual saving, and thats just a projection, the actual amount of money saved will probably be much less, not mention the money lost when a customer decides to buy a competitors car that uses your technology. Peugeot has no significant technologically advanced system of anything im aware of, nothing like Mazda’s skyactiv or even something as small a system as advanced blind spot monitor that GM cant develop on its own or already has. They dont have any significant hybrid technology that GM is behind in. There diesal engines, while probably better that GM’s, are not light years superior, and again, not a difference that GM could not cover alone by itself. I can think of more problems but im going to end here otherwise ill bever stop writing. The way I see it, Peugoet won, just as Fiat did in 2005. Imagine winning against the biggest and one of the world’s best automaker while youre about to go bankrupt. Oh, and I dont see anything in conservative ideology that would prohibit a conservative from buying a volt. Those that say there is something, there probably runnign for president. Well I think you’re making some conclusions that you are not qualified to make. Where do you come to the idea that GM is maxed out on quantity of scale? Clearly that was the driving force for this alliance from GM’s perspective, if they are maxed out as you say, then there is no reason for the alliance. I don’t think any automaker can ever be maxed out in that sense, there are millions of components that get used on some models and not others and you can’t use the same components in every vehicle that you make. Obviously this is a long term solution, which is healthy. The other thing to keep in mind that the scale may differ by geography, especially when it comes to buying power. For instance, it may be less expensive to buy an American-made part in America due to GM’s huge scale and volume here. In Europe, though, it may be less expensive to buy and build in Korea unless a company has even greater scale to buy in Europe… which may or may not offer huge subsidies to do business within certain geo borders. There are just so many factors that we may not know about, especially when it comes to specific geographic levels, that the deal may not make much sense to us… but it does internally for GM. Youre right, im not qualified to make these conclusions, but then I dont think most of us are legally qualified to make alot of ideas we have. Thats why I am not being paid for coming to these conclusion and thats why I said “in my opinion”. Everything I said is an opinion, not a fact. Of course you can never be maxed out, but for example, if company x buys 1k units for $1k, then buys 10k for $8k, then buys 100k for $75k, then buys 1000k for 720k, basically the benefits of quantity of scale decline as the actual quantity goes up. Thats just simple Microeconomics. Its not that I dont think GM will benefit, its just that I dont think the benefits which are only involve saving money, are worth the risks associated with this alliance. If GM was short on cash, I would say good deal, but its not. I dont think saving some money annually is a “long term solution” to GM Europe’s problems. Do a restructing that was similar to the one in the US.Do bankruptcy if you have to. Move Opel upmarket and then seriously bring in chevy as the volume brand. Obvious, but Make better cars. GM should be pouring money in Product rather than buying stakes in companies that may not have even survived the decade without assistance. Those are just a few ideas, im sure theres much better ways to fix Opel than just save a lousy several hundrend million a year with a tie up with an automaker on the edge. Do you want to explain what exactly about my comment was stupid and exactly why? I am open to criticism and if I made an incorrect or factually wrong statement, correct me. However calling a comment stupid without providing any evidence about why its stupid, is, quite frankly, stupid. I think @miath was referring to the “gun rack” comment made by a certain politician… not to your comment. Oh, Sorry Miath, Ive been up for over 20 hours, not thinking straght. The more American the car, the more I personally like it. This is not just parts content or assembly location, but engineering, design, R&D, corporate, etc. I see your point, but I believe that what you’re describing is on its way out not just for the U.S., but for every other nation. An “American” Cruze that’s sold all over the world has input in R&D, engineering, design, safety, technology, and more from all over the world across GM’s labs — hence being a vehicle that’s sold on a global scale. But the same is happening for Toyota, where the new Camry is designed, engineered, etc. in Japan and America. It’s a global world, we just live in it. Ah, and one more thing: I truly believe that by incorporating skills and effort from all nations/geographic regions, the product ends up being better as well. If Peugeot knows how to design an armrest, then I’m all for the deal. PSA has things that GM really and truly needs. A good small diesel engine, for example. PSA makes some of the best around. But what is of more concern to me is how is it that this helps Opel/Vauxhall. Diesel engines alone won’t solve the oversupply problems in Europe. Maybe Peugeot citroen will be the Vaxhall of France. Built in Opel factorys and rebadged as a Peugeot and or Citroen. This will make Opel factorys run closer to capacity and increase profit. I’m wondering how this will affect the already in place BMW/Peugeot connection. How many of you know that the current generation MINI Coopers have Peugeot engines in them? I’m wondering how this might affect the already in place BMW/Peugeot connection. How many of you know the current generation MINI Coopers have Peugeot engines in them? I thought I even read somewhere that BMW was going to use Peugeot in developing their FWD cars. Will this affect GM any? Wonder what us going to happen to the Peugeot Ford diesel engine program. lately, I see more articles on GMAuthority that have a political slant. I believe that that is not a good idea, because it unnecessarily puts people off. And as a conservative Republican, I agree that there are people in my political camp that have made it a sport to unjustifiably critizise GM way beyond what is fair game due to past mismanagement and the bailout. I would even agree to any effort on GMAuthority to point out these inaccuracies, but I believe it harms the mission of GMAuthority to have an Opinion Desk regarding political opinions ( auto design or auto engineering opinions are perfectly fine, but not political opinions ). There are a lot of Republicans who take great pride in their GM cars and in our domestic auto industry, and who are cheering with Clint Eastwood ( a Republican ) to bring Detroit back and become the dominant force in auto manufacturing again. Even Glenn Beck, who bashes the Volt every day with incorrect, exaggerated statements on his radio show, declared that he actually likes GM. I conclude that most of his disdain stems from Obama’s involvement in GM. Shawn Hannity drives a Cadillac Escalade Hybrid, and George Bush after all was the one who initiated GMs bailout. Mitt Romney’s father is a fromer GM exec, and he would have bailed out GM, too, even if he can t quite say it that explicitly. And John Mc Cain would have done that, too. And there is significant reason to critizise Obama over how he handled the bailout, giving most of new GM to the Unions who were a big part of the reason for why GM failed. There is critizism to go around everywhere, Republicans, Democrats, GM Management, Unions. I would urge you to change direction and completely leave politics out of this, because it hurts the mission. For example, I had trouble using the Volt article about incorrect Fox News coverage about Volt taking 3x as long, costing 3x more than driving a regular car for a given distance, because the article had some outright liberal comments in it, even though the GMAuthority article was absolutely factually correct. Hart — thanks for your feedback. Contrary to how it may appear, the article wasn’t singling out a particular party, even though there was a considerable amount of reference to the “gun rack” gag, which happened to be the equivalent of a pop news story for the auto industry. In any event, the point was to open the eyes of any person and/or party, Democrat, Republican, Independent, or other, to the real benefits of the alliance with PSA Peugeot. Nothing more, nothing less. That said, I do take issue with parts of your statement. For instance, why would Glenn Beck bash the Volt even though he likes GM? This doesn’t make any sense to me. It would seem that people are putting politics first… rather than looking objectively at a great piece of engineering, technology, and development that is the Volt. And that bothers me more than anything else.